It’s always really amazing to lead a workshop. 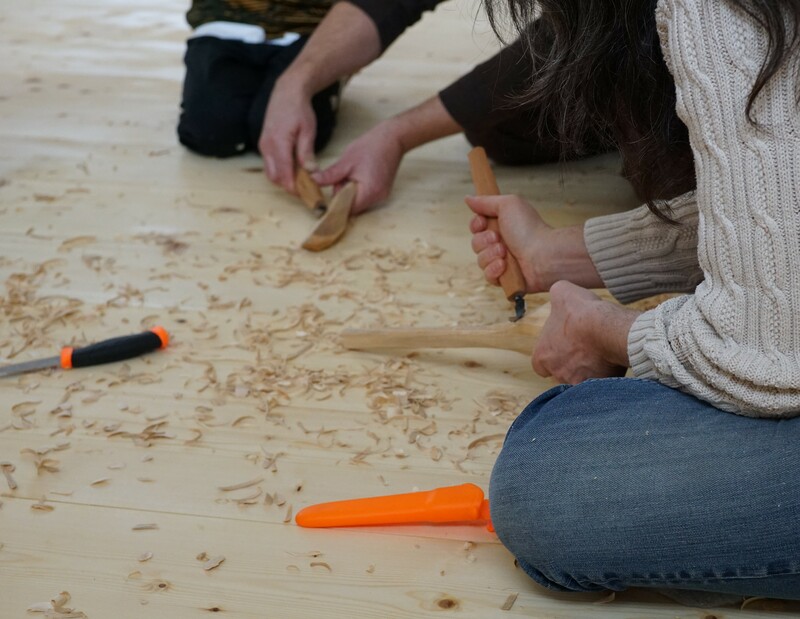 Last weekend I had the great fortune to “inaugurate” Cloud Mountain Living Arts with a green wood spoon making session. It was a warmish, grayish day…slightly icy, slightly muddy… But once I stepped inside the Dojo building I was welcomed to a beautiful warm space, brightly lit by lovely windows and vast uninterrupted floor space. Hosts Heidi and Ben Pincus put on a fantastic lunch including tasty offerings from some of the participants. 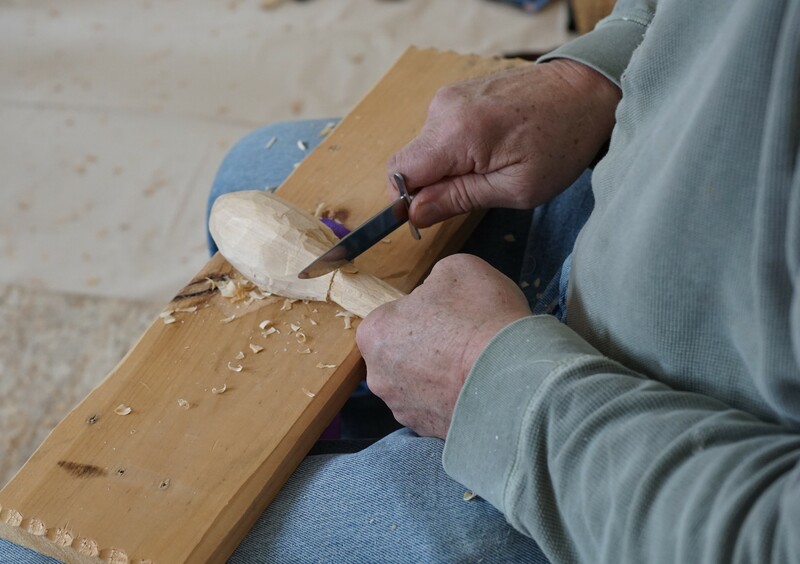 We did a short spoon carving talk at the start, and dove right into carving. 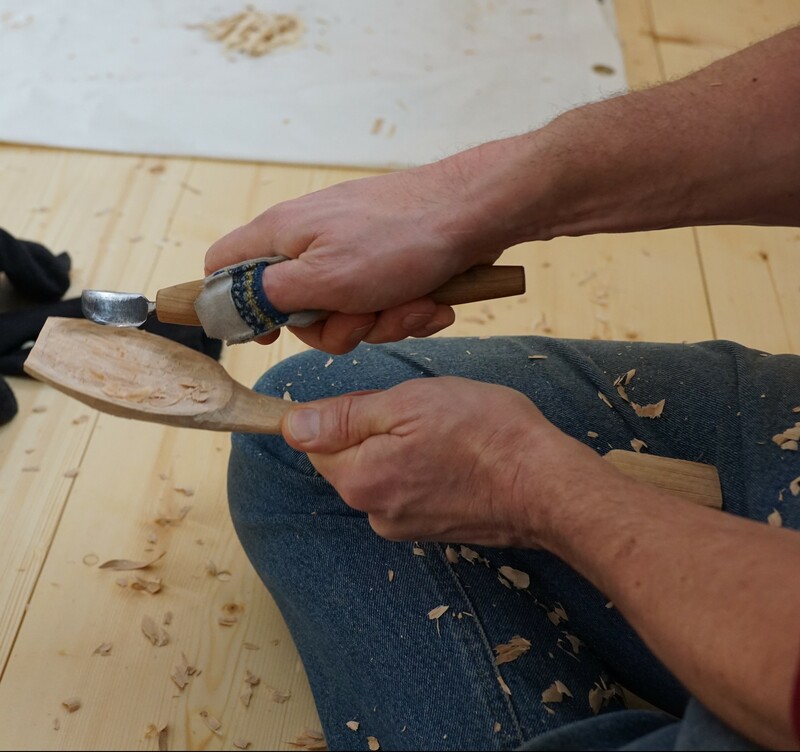 We were working with freshly cut Beech from the local area, and primarily using the double-bladed Deep Bent Knife from North Bay Forge. Despite all the safety warnings and a very cautions crew, hardly anyone was spared from a “nick of the knife”, so the band-aids were out in force. One young participant asked me, “is this the bloodiest workshop you’ve ever had?” There was little time to waste, and even though the delicious lunch was waiting at noon, folks were hard to tear away from their industry. It was a beautiful sight to see this lovely group all seated at a long table chatting and eating lunch. I could see some connections being made. 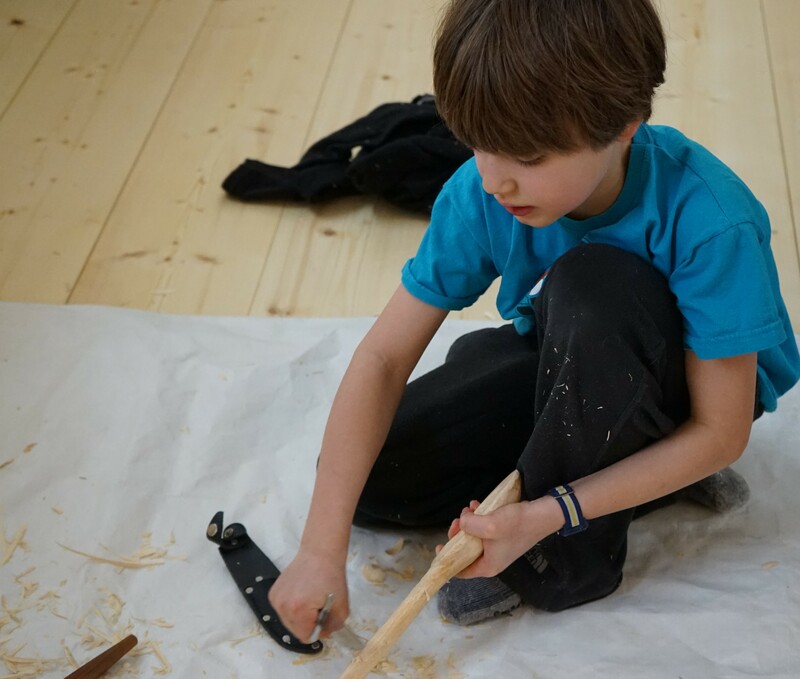 Connections with wood, knives, people. A truly great day. Even in a 5 hour workshop, there is scarce enough time to make it around the room enough to spend quality minutes with each participant. Still I was able to share with and learn a little about each person. I can’t say enough about how fortunate I feel to get to share a craft I love so much with so many friendly people in such a lovely setting. I learn so much every time I do this, and each workshop builds on the last. 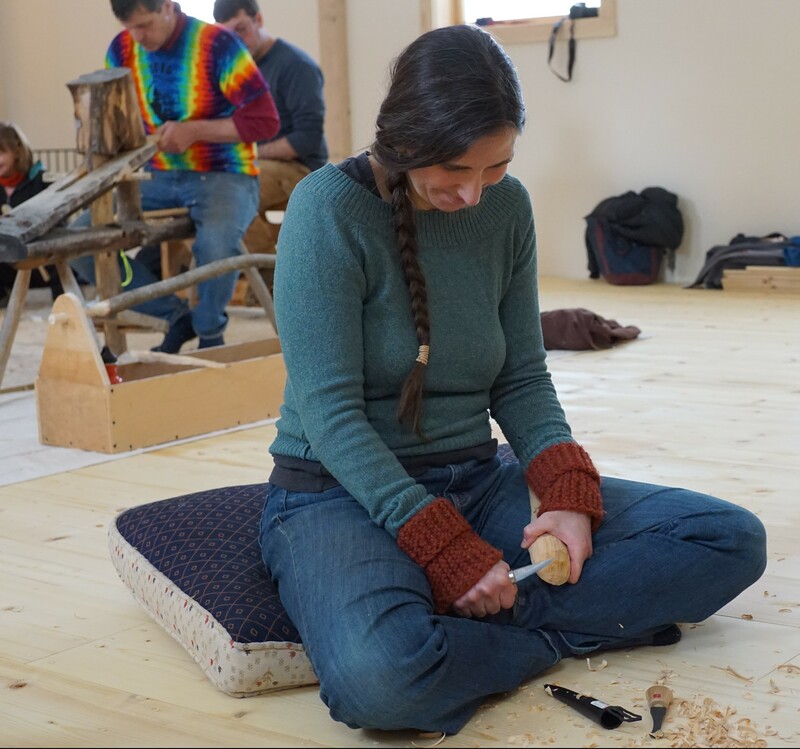 Thanks to Heidi and Ben, Cloud Mountain Living Arts, and all of the participants for a wonderful Sunday in February.